Winslow Homer wasn't all Prout's Neck, Maine dramatic sea paintings and scenes of children at play. Those came later. At the beginning of his career, age 25, the self taught artist marched off to the Civil War armed with drawing utensils and paper. He was one of a select group of artist-reporters embedded with Union troops documenting battles and camp life for Harper's Weekly Illustrated, then the premiere illustrated newspaper in the country. Artist-reporters were on the front in every sense - facing battles, injuries, starvation and disease along with the fighting men and women. Their job was to be astute observers with an instinct for story and drama and the ability to sketch quickly and accurately in highly dangerous and exhausting circumstances. Homer brought his bedrock insistence on truth telling to that job. 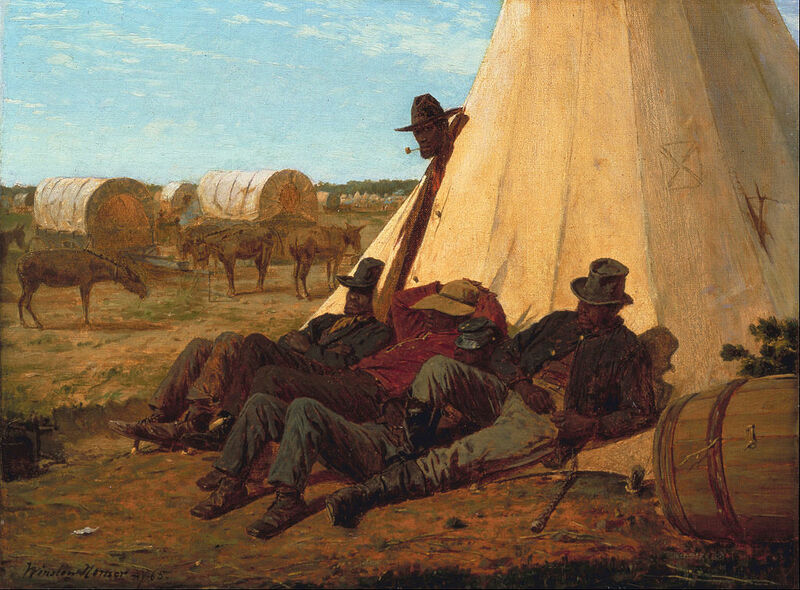 Probably no contemporary artist looked with clearer eyes, and he did as much as anyone to give Harpers's and posterity a visual representation of the Civil War. After the war, Homer went on to have a distinguished career as an oil and watercolor painter and also continued to produce commercial illustrations for Harper's and other publications. But he was always an artist-illustrator at heart. He considered his war work to be a public service, intentionally endured some of the same experiences as soldiers did and - according to his mother - was fundamentally and forever changed by what he lived, witnessed and recorded. *One of the exceptional paintings from the Rockefeller Collection Bequest of American Art to the Fine Arts Museums of San Francisco. Hangs at the de Young Museum.